A name from the Miami Open's past kicked off the tournament's future Wednesday. 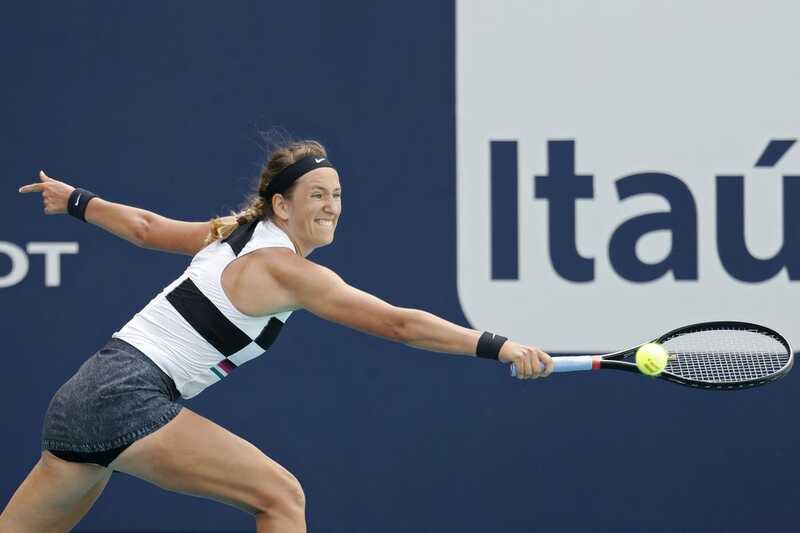 Belarus' Victoria Azarenka, the Miami champion in 2009, 2011 and 2016, won the first match in the event's new home in Miami Gardens, Fla., defeating Slovakia's Dominika Cibulkova 6-2, 3-6, 6-4. The tournament is now being held at the Miami Dolphins' complex at Hard Rock Stadium after 34 years at Crandon Park in Key Biscayne, Fla.
Azarenka served nine aces and had five double faults, a big edge over Cibulkova, who finished with no aces and seven double faults. But the day's focus was on the new venue, which opened a day later than expected due to a rained-out slate Tuesday. Defending champion Sloane Stephens, a Florida native, said of Key Biscayne, "I've been going there since I was 14-years old. It's sad times, and we're going to miss it, but they worked really hard on this venue, and it looks great so far. Hopefully there'll be more good tennis played here." Third-seeded Petra Kvitova of the Czech Republic said, "Key Biscayne was beautiful, but it was never my favorite. For me, it might be a good thing that we changed, and we'll see what happens here. It's nice to be out of the routine." Czech player Karolina Pliskova added, "I think the court is nice. It didn't look as big as I thought, and there was a big shadow because of the roof, but otherwise I think it's perfect. I also hit on the outside courts for the first time. It looks a bit like a factory, with 10 courts in a row!" Other winners included Spain's Sara Sorribes Tormo, Greece's Maria Sakkari, Kazakhstan's Yulia Putintseva, the United States' Amanda Anisimova, Slovakia's Magdalena Rybarikova, Australia's Samantha Stosur, France's Pauline Parmentier, Ukraine's Dayana Yastremska, China's Xiyu Wang and the Czech Republic's Katerina Siniakova and Marketa Vondrousova. Bianca Andreescu, the 18-year-old Canadian who earned a stunning championship Sunday in Indian Wells, Calif., was scheduled to oppose Romania's Irina-Camelia Begu on Wednesday night. However, the match was postponed due to rain. The tournament's top 32 players, including top-seeded Naomi Osaka of Japan, second-seeded Kvitova, third-seeded Simona Halep of Romania and fourth-seeded Angelique Kerber of Germany, received first-round byes.